Oh Paris, you’re just amazing. That view you gave us from our apartment, the windows flung open to let the evening breeze finger through? I’ll never forget it. 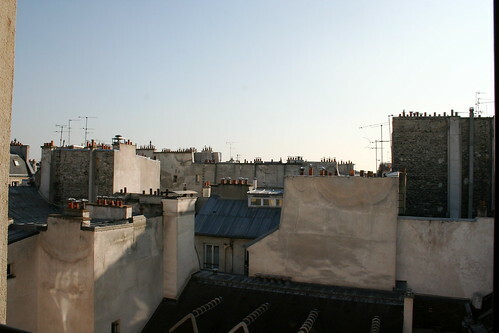 I’ll never forget the doves (pigeons, what have you) cooing from the rooftops, Marais unfolding as a series of terra cotta roofs. 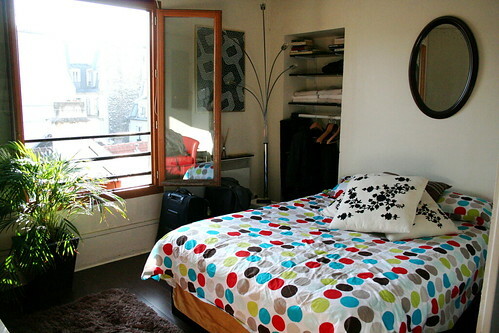 And that apartment! 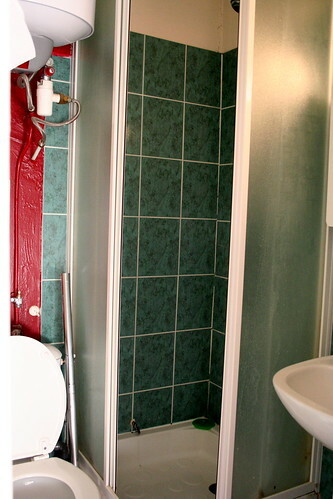 Sure it was tiny, but what more do you need than a bed, a shower, and some wine glasses? 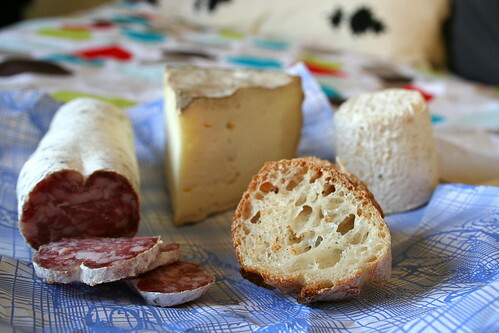 The fridge didn’t hurt since we could pick up some cheese (le Chabichou & Tomme de Savoie) and charcuterie (Sauccisson sec de Sanglier). 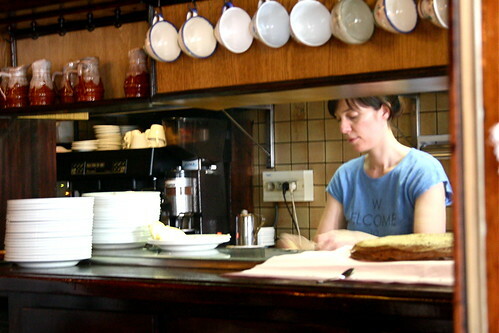 Each morning, we’d stumble out and find our perfect breakfast at the bakery just around the corner. 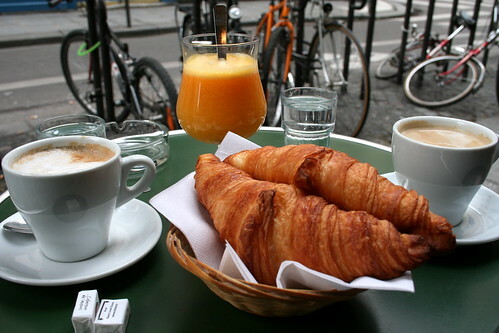 Thank you for your croissants and that thick, spoonable orange juice from the cafe next to the bakery. Thank you for the spare cups of cafe au lait, rich and deep and oh-so-caffeinating. 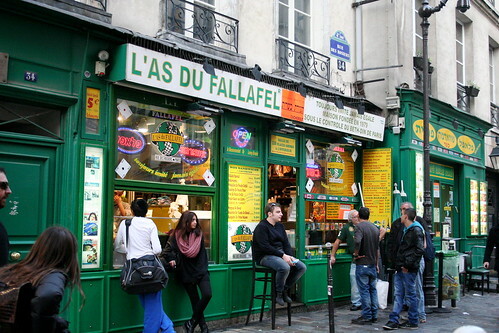 But breakfast wasn’t all–you gave us L’as du Fallafel, just a block or two away from our apartment, the mecca (yes, David Lebowitz was right) of falafel. 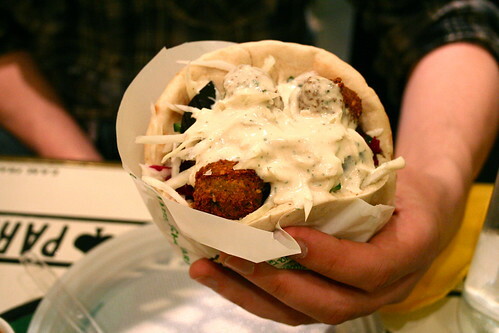 Those fried chickpea spheres were hot and crunchy, the cabbage slaw refreshing, and the tahini so creamy. I had to eat it with a fork. And the harissa? I want to slather it all over everything I eat now. Oh, sure, both the top of the Eiffel Tower was closed due to a two-month long elevator issue and the Rodin Museum was closed for renovations (with the garden open for free, at least), and, sure, I was pretty bitter about that, but at least the weather was drop-dead gorgeous for the first two days: sunny with temperatures in the 70s (Fahrenheit). 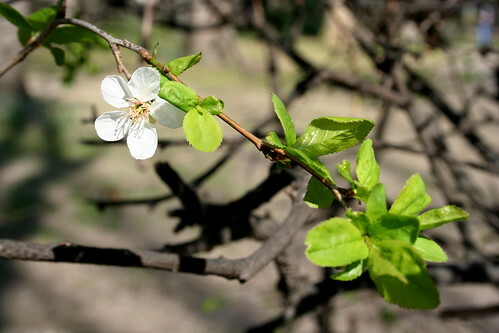 Paris, you gave me spring when I least expected it! 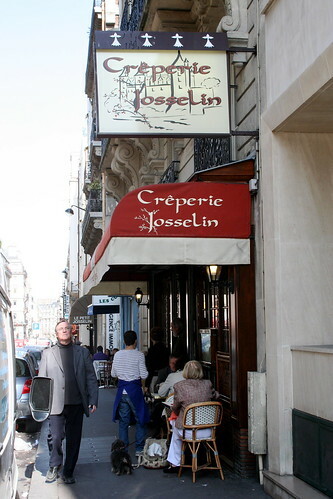 And even though the Rodin Museum was closed, Creperie Josselin wasn’t, and it was right around the corner, and, mon dieu, I could have never died happily without eating those crepes and drinking that cider. 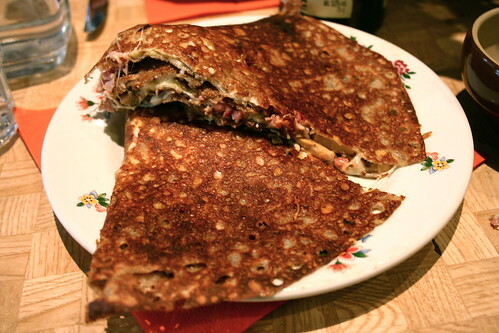 A buckwheat crepe stuffed with egg, cheese, ham, and mushrooms? Or how about one stuffed with egg, cheese, bacon, spinach, and cream? 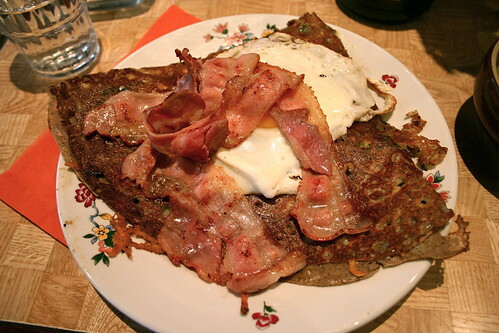 I’ll never understand why your creperies aren’t open for breakfast, but I’ll forgive you for the crepes made a delicious lunch. Crispy and hot with freshly cooked fillings, I’m wishing I were there right now. And the cider? The best I’ve ever had, and unlike any other–very dry with a deep but not sweet flavor. Almost like a stinky cheese, tasting of the wild. 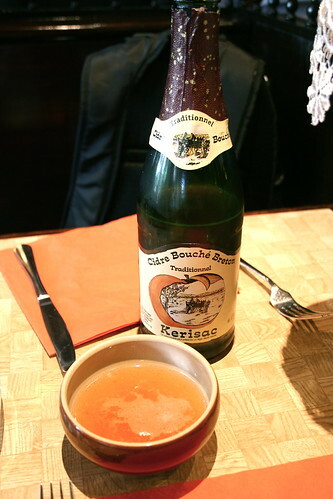 Cidre Bouche Breton Kerisac, I must find you somewhere here in Virginia. You have to exist. 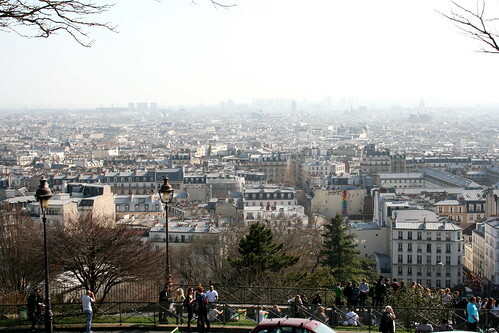 But after eating too much butter and deliciousness, you left us no choice but to tromp up the hills of Montmartre to Sacre Coeur in all its white shining glory, the city unfolding in a hazily past our feet. 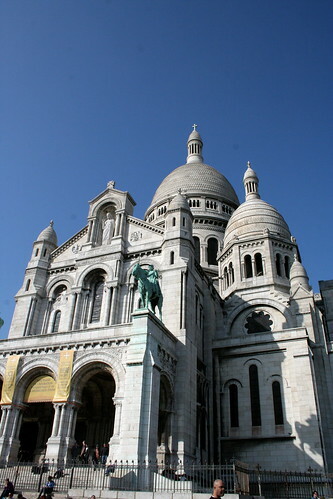 I didn’t go inside or climb to the top of it, but I’m sure it’s a beautiful church, if not too crowded with tourists. It’s mind-boggling how big you are, Paris, I couldn’t even see the edges. Inspiring, really, and a reminder of how young and insignificant my country really is. We’ve got a few centuries before we ever turn out to be anything like you. 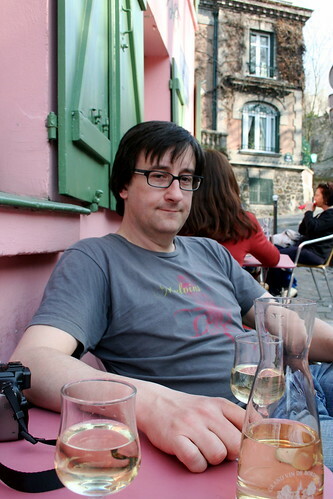 Mostly, though, thank you for your cafes and pitchers house wines, your shady tables with puppies running around. I’m addicted to that now and going through a bit of withdrawal, but I’m grateful for the time I had to enjoy them, for nothing closes off a busy and satisfying day like a glass or three of wine. Nothing. 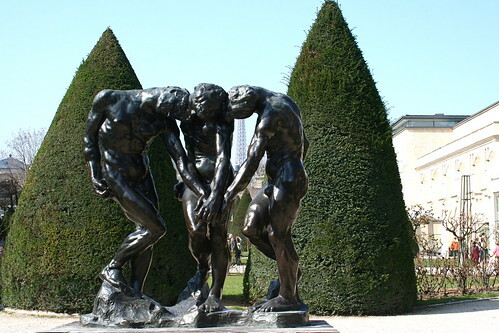 Fantastic photos of Paris — looks like you had a wonderful time. I can’t wait to be there next month! Do you or G speak any French, by the way? I speak a little, so I used it some, but everyone was incredibly friendly and helpful and spoke English so it wasn’t a problem! 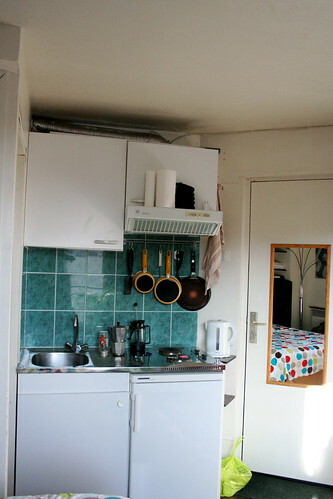 I adore this post… Paris. sigh. Lucky you! 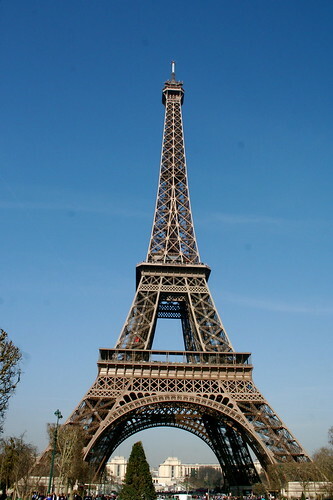 I want to see Paris! That breakfast looks so good, man, I love me some croissants (pronounced in really bad French). I did not know that creperies aren’t open for breakfast. It seems like they should be, doesn’t it? Too bad the top of the tower and the museum were closed. Maybe next time? love! i want to go terribly! and when i do, i’ll use this post as a guide.